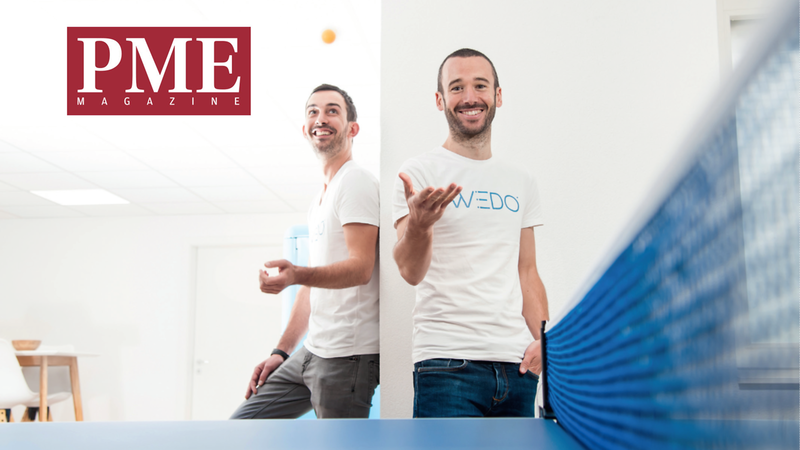 Antoine Sudan and David Dutch are two friends who created WeDo after discovering the joys of working and planning meetings. Before being associates, Antoine Sudan and David Dutch were two teenagers living in the Broye region and taking the train together to go to school. They dreamed of creating their own company together but they needed some work experience, so they both started to work once they got their engineering degree. They soon discovered the surprises and disillusions of corporate life. “Collaboration was not as easy as expected, especially during meetings”, explains Antoine. “We were often missing answers and solutions to simple questions such as ‘who takes care of what’, ‘how’ and ‘for when’, regardless all the e-mails we were receiving”. Therefore, the two friends had an idea: develop a collaborative task manager to simplify work progress. They started to work on their project from of 2014. What differentiates them from others is that no funds were raised for their project: they developed their software on their own while they were still working. Furthermore, to optimize their product, they contacted their potential customers and questioned them to have a clear idea on their needs and point of view. They conducted more than 300 interviews to develop their tool in the best possible way. The first version of the software was launched in May 2015 and was first tested with a few of their sales leads who were curious to discover its functionalities. Their software is thus an organizational solution. It is a common and collaborative space to which everyone has access and can follow the work progress in real-time. Hence, people know exactly who is in charge of what and for when it is due. No need to make several calls or to send amounts of e-mails to give a feed-back on a project. The interface is made in a didactic manner and is within everyone’s reach. The price varies according to the number of users and is between 15 and 25 Swiss francs per month and per user. Hence, the software allows to manage meetings, tasks and check-lists at reasonable cost. Nearly three years after the first launch of the software, the contractors, who are today 31 and 32 years old, have proved successful. More than 40 health facilities are among their customers, and other companies such as Groupe Mutuel. Christian Lalain, member of the IT department of the insurance company, first discovered WeDo when he was the municipal councilor of Saillon. “I wanted to find a solution to the traditional paper files on which we would stick a post-it note with essential information or updates, which would eventually end up being lost or worn down. For that reason, I installed WeDo on the municipality’s computers last year. It’s great: everyone is working on the same tool and the different working spaces structure all activity. If a person calls to make an appointment with a particular person or for an information, the person at reception can create a task and assign it to the corresponding person, who will receive a notification. She will then know exactly what to do or what to answer if the person calls back. The software thus improved communication and interaction not only among collaborators, but also with our citizens. It definitely improved the quality and efficiency of our service and increased our team spirit”. Given the positive results observed in Saillon, Christian Lalain suggested his employer at the Groupe Mutuel to use this tool. Groupe Mutuel previously used another tool called Wunderlist, purchased by Microsoft. The start-up company from Fribourg is proud of its success and is still growing surely but slowly. “Once our first client signed, there was a second, and a third…” recalls David Dutch. “We first reduced our working time, then we became self-employed. We are now established as a LLC and our office is based in Fribourg. And we are hiring! We are planning on hiring two new collaborators this year”. The two associates started off by looking for customers before going to fairs. In Switzerland, there are very few competitors. As their servers are based in Switzerland, they can claim their 100% swiss origin, a key argument for customers who fear data theft. Source : Article original du PME Magazine.